Mawwage! Mawwage is what bring us togewer today. Or at least, inspired me to make this quilt. This is a gift for one of my oldest friends (in that she is a friend I have had for Some Length of Time) and her new and shiny husband. They both have a love for Japan and the colors red, white, and black. I strip pieced the fabric, and then cut and pieced the blocks according to . Less cutting and opportunities for poor piecing? Sign me up! 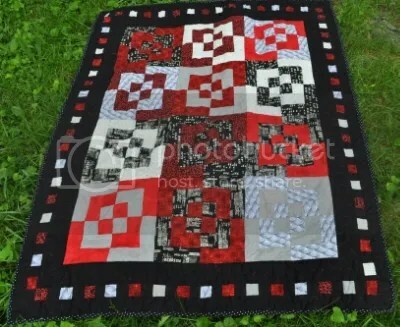 I quilted it in the ditch around the blocks, and with swirls in the border. 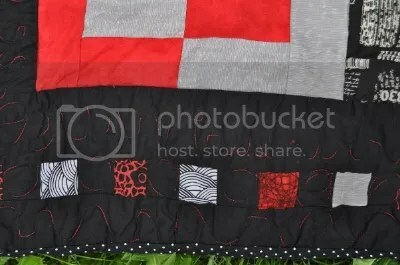 I used my favorite (so far, I haven’t tried Aurafil, since we don’t carry it at work) quilting thread, King Tut, in a variegated black and red. It looks really cool on the back, too. 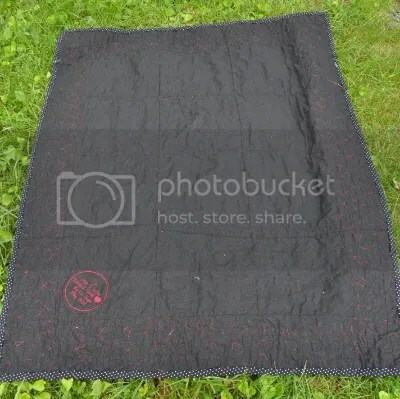 I enjoyed putting this quilt together, and I hope that J & L enjoy it, too.